It was an email that made me stop in my tracks, think, and smile. Summer had called me out on a major shortcoming of my blog, and one that I wanted to remedy. The truth is that everything here (seriously, everything) is political and for better or worse, I try to keep my head down. But I’m passionate about the foods of the region and want to share them with my readers. Many of the most iconic Israeli dishes – falafel, shawarma, hummus, etc – are culinary transplants from the surrounding countries, which is completely natural. While each place has a distinct cuisine, history and proximity have led to lots of overlap in recipes. In a follow-up email Summer wrote, “I just feel that Middle eastern food in general and Palestinian food especially, is not represented enough in the food and cooking industry and only the tip of the iceberg is known.” It’s so true! So, here is my first attempt to remedy that. I offer fatteh and hope to bring you many more Palestinian and Levantine dishes in the near future. While the recipe here is vegetarian, Summer says that chicken fatteh with rice (see her recipe here) is the national dish of Gaza. And in general all manner of fatteh are served during the month of Ramadan (see also Summer’s chickpea fatteh recipe with video here). Popular throughout Egypt, Palestine, Jordan, Syria, and Lebanon, fatteh takes minutes to make and is an incredibly satisfying snack or appetizer. The ingredients come together to create contrasting textures and temperatures in what can best be described as a deconstructed hummus dish. Put the chickpeas in a small pot along with 100 ml (½ cup) water and simmer over medium-high heat for about 10 minutes, until the water has mostly absorbed and the chickpeas are heated through. Season with salt and remove from the heat. Meanwhile, put the yogurt, garlic, cumin, lemon juice, tahini paste, and a pinch of salt in a large bowl and whisk until thoroughly combined. Whisk in a little water at a time if the mixture is too thick, until a desired consistency is reached. Break up the toasted pita wedges a bit and arrange them in an even layer on the bottom of a deep serving platter, bowl, or casserole dish. Top with the warm chickpeas, then the yogurt sauce. 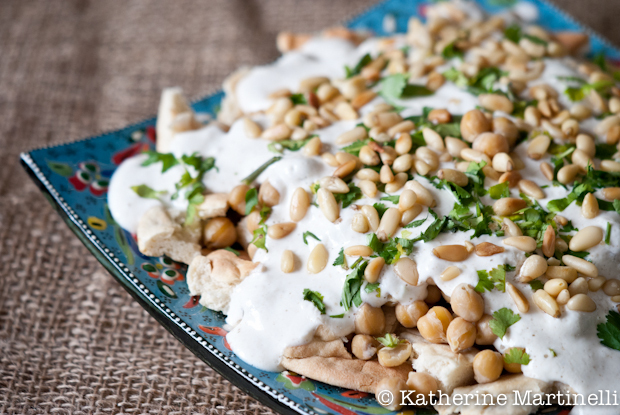 Sprinkle with pine nuts and parsley or cilantro and serve with additional pita or pita chips. If the blog hop doesn’t show up below, click here to view the collection and link up your recipes! Katherine, love this post and the recipe you included. The photos speak volumes! I could eat them. It’s a poor man’s village recipe…we make it with ox tongue.. I do adore a deconstructed pile of goodness 😉 and I’m always a fan of new ways to use up leftovers. Interesting points to contemplate, and I look forward to seeing all the new things you’ll be sharing! Liked the meaning of the word fatteh. Sounds very wholesome. Maybe I could sprinkle it with zattar which I love, love, love. Thanks! Love your recipe, Katherine, and I plan to share on my Facebook page later today. Also looking forward to checking out some of these other recipes. Your roasted chick pea dish with feta and mint looks divine as well! This must be uber delicious! I absolutely love this as an appetizer idea! Great looking dish! And interesting perspective from your Palestinian correspondent. A lot of food seems to know no boundaries, so the more versions we can sample the better I like it. 😉 Good stuff – thanks. A new salad to try that takes advantage of my pantry, looks delicious and what a wonderful idea to highlight the chickpea. I can’t think of a dish I haven’t enjoyed, across all cuisines, that call for garbanzo beans (even Persian chickpea flour cookies). I look forward to checking out the other recipes as well! And now I’m craving this! Great flavors, filling, but not terrible for you. My kind of snack! Food really does transcend. I was also struck when reading the new cookbook Jerusalem by their thoughts on this. If you haven’t seen it yet, it is a must buy! I am so happy to find this recipe. I had fatteh for the first time in Abu Dhabi last week and I loved it. The version I had was just like this recipe but with pomegranate seeds. Can’t wait to try making it! Everyone knows that all these foods you have spoken of are NOT Israeli…………..they are 100% middle eastern. Please get a clue!!!! Israel is part of the Middle East. Please don’t fight over food, you’ll get indigestion. So refreshing to see and cant’ wait to try your recipe out. thank you! Since I’m Armenian, I can relate to this article and its political undertones, because our traditional Armenian Cuisine is claimed by Turks and Azeris as “Turkish Cuisine” – when in fact none of it is theirs. According to their “historians” Armenian food is a myth, of course these people are experts at reversing facts. A Turkish trait is to always kill/steal then blame the victim, as they do today with their state-sponsored denial of the Armenian, Greek and Assyrian Genocides they committed a century ago. According to Turkish/Azeri logic, Armenians apparently ate leaves and rocks for three thousand+ years until the wonderful nomadic Turks showed up from Mongolia to teach Armenians how to make food with ingredients which could of course only be found in Armenia and the surrounding region at the time. And of course, morons never figure out that they are in fact what they are – someone needs to constantly remind them. 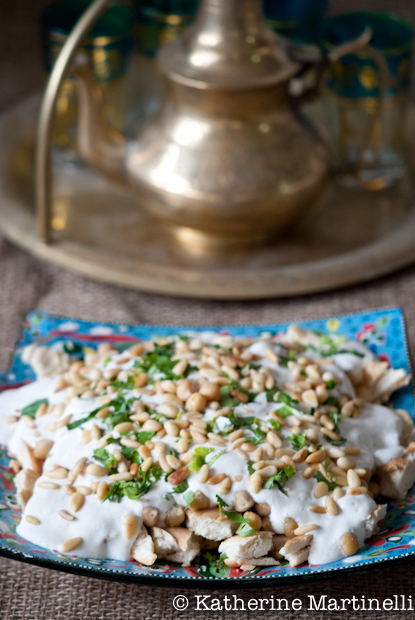 Now as for fatteh, we consider this as Syrian Cuisine and it is pretty close to your recipe, except to enjoy the full flavor of this dish, typically the pita chips need to be fried, and the yogurt noticeably garlicky. Variation: you can also try sprinkling the yogurt with sumac if you have it and don’t have any lemon on hand. The wiki article states this is a “southern Levantine” dish, and I would say that someone is trying to make this dish sound as a Palestinian dish perhaps by using the word “southern”. However if you click on the term then you go merely to “Levantine Cuisine”, not “southern”. Thus this is a point of contention. However, I do agree that the Palestinian Cuisine should be recognized on its own because I’m sure that the nation has unique foods which others traditionally don’t (or perhaps their variations). Its just that if a certain dish is spread among many countries, it is difficult to prove what is from where. This is how our Armenian cuisine has been stolen by Turks, because no one bothered documenting the origins of foods until relatively recently. However, in the case of the mythical “Turkish Cuisine”, only logic would need to be used to prove that Turkish Cuisine is in fact a myth. Your comments of staying away from “political” inadvertently drives a political discussion. Since so many countries are represented, maybe just say Middle Eastern. Stay away from the indigestion.